The Chairman, House Committee on Youth and Social Development and the lawmaker representing Ikeja Constituency 2 at the Lagos State House of Assembly, Honourable Adedamola Richard Kasunmu received emphatic commendations at the constituency Stakeholders Meeting held at Ikeja Local Government secretariat on Tuesday, November 10, 2015. The stakeholders meeting, which took place simultaneously in all the 40 constituencies across the state, was facilitated by Lagos State House of Assembly to enable government feel the pulse of the people through constructive interaction and engagement between the constituents and their elected representatives. He also said that “since the commencement of the current 8th assembly in June 2015, a total number of 28 resolutions have been passed covering on a broad range of socio-economic, political and either issues pertaining to the welfare of the Lagosians, the progress of the State and the nation as a whole”. 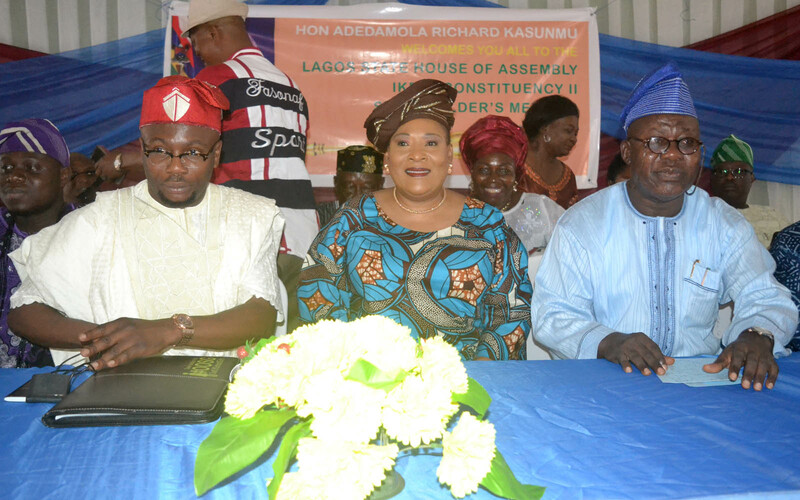 STAKEHOLDER 1- (L-R): Member, Lagos State House of Assembly, Hon. Adedamola Richard Kasunmu; Southwest Woman Leader, APC, Chief (Mrs) Kemi Nelson and Executive Secretary, Ikeja Local Government, Hon. Dally Adedokun during the Ikeja Constituency 2 Stakeholders Meeting held in Ikeja on Tuesday (10th November 2015). Ikeja Constituency 2 is made of Ojodu LCDA and parts of the present Ikeja Local Government Area. The stakeholders meeting, which held under the colourful ambience of Ikeja LGA’s main auditorium, had in attendance large numbers of people from across the constituency including royal fathers, religious leaders, community leaders, party chieftains, past and present political office holders, Igbo and Hausa community leaders, market leaders and other categories of people. Giving account of his stewardship since the inception of the 8th Assembly, Hon. Kasunmu revealed that apart from performing his statutory oversight functions, serving as member of various ad-hoc committees and offering insightful contributions to debates on the floor House, he has also assisted in influence Tertiary Institution admission, employment and business opportunities for members of the constituency. During the interactive section, some of the stakeholders who spoke at the meeting tasked the lawmaker to use his office to bring more development and empowerment to the constituency. They also listed areas of urgent attention and implored him to pass the message across to His Excellency, Governor Akinwunmi Ambode through the House of Assembly for immediate action. Some of the areas of intervention pointed out include road maintenance, security, employment, healthcare, youth empowerment, market development, alleged excesses of some government agencies among others. The stake holders congratulated the youthful lawmaker on his appointment as the Chairman, House Committee on Youth and Social Development and applauded his purposeful representation in the House so far. STAKEHOLDERS 2- Member, Lagos State House of Assembly, Hon. 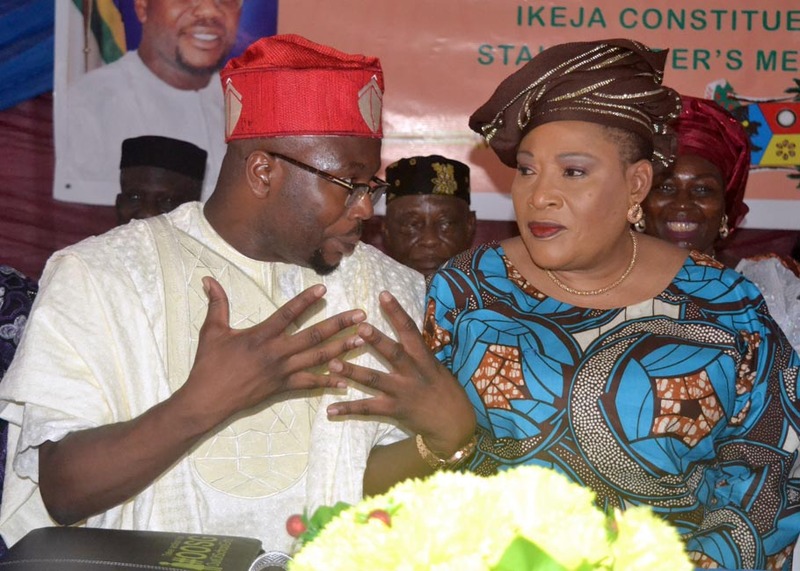 Adedamola Richard Kasunmu (left) and Southwest Woman Leader, APC, Chief (Mrs) Kemi Nelson during the Ikeja Constituency 2 Stakeholders Meeting held in Ikeja on Tuesday (10th November 2015). In his response, Hon. Adedamola Kasunmu reassured the people of his resolute commitment to providing quality and responsive representation to the people of Ikeja 2 at all time and revealed that almost all the issues mentioned by the stakeholders had already being included in his action plan before the inauguration of the 8th Assembly. According to him, “I am currently working on a number of bills and motions that will soon translate into Executive actions on infrastructural development and urban renewal that will cover all the areas in the constituency.” Hon. Kasunmu also stated that a youth and economic empowerment scheme through sports development, employment, job creation, micro-credit to small scale businesses, ICT and vocational training will soon be implemented across the constituency. Enhancement of security of lives and properties, improvement of infrastructure in educational institutions in the constituency as well as participatory representation are also included in the lawmaker’s agenda. Notable stakeholders at the meeting include the Executive Secretary, Ikeja Local Government, Mr. Adekunle Dally-Adedokun; his Ojodu LCDA counterpart, Mallam Moyosore Jaji; APC Woman Leader, Southwest, Chief (Mrs) Kemi Nelson; the Regent of Ikejaland, Prince Adekunle Apena; Chief (Mrs) Modupe Olaiya; Muslim leaders from Ikeja, Ojodu and Ogba; Christian Association of Nigeria (CAN); CDC and CDA leaders; Iyaloja of Ikejaland; APC Ward Chairman from all the ten wards in the constituency; members of the opposition parties as well as several other personalities and interest groups. It was an impressive outing for the cerebral legislator.